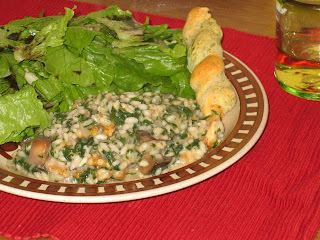 One of my favorite things to make and eat is risotto. It's one of the few Italian dishes that can be both vegetarian and gluten-free in (a version of) its original form, and it's incredibly satisfying to eat. Plus, as I've discovered as I've gotten used to making it, it can be made with a wide variety of fresh vegetables, as long as the basis ingredients are on-hand. 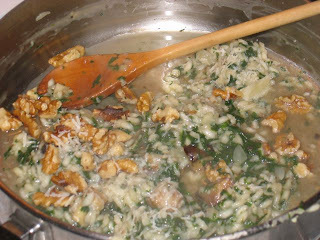 What I know of making risotto, I owe to The Joy of Cooking and to Risotto, by Ursula Ferrigno. The proportions in the recipe below come mostly from the Joy of Cooking recipe. 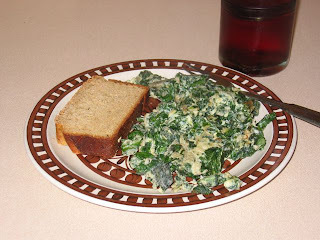 To make this recipe, I started with about 1/4 to 1/2 cup steamed fresh spinach and about 3/4 to 1 cup cubed eggplant that had been sautéed in olive oil and garlic. I also toasted about 1/4 to 1/2 cup raw walnut pieces in a dry, cast-iron skillet over medium-high heat, until just fragrant, then set them aside on a saucer. 1. Bring 2 1/2 cups vegetable broth to a boil, then reduce to simmer and cover. 2. Finely chop 1/2 medium white onion. Heat about 1 Tbs olive oil in a deep skillet over medium heat and add the onion, sautéing until soft and translucent. Mince and add three cloves of garlic. 3. Stir in 1/2 cup arborio rice, until rice is coated and turning translucent. Add 1/8 cup white wine (I had some Pinot Grigio open in the fridge) and cook, stirring, until liquid is mostly absorbed. 4. Add a ladle-full of the broth to the rice, and cook, stirring, until mostly absorbed. Repeat this step until most of the broth has been used and the rice is creamy-looking and al dente. This will take about 1/2 hour. 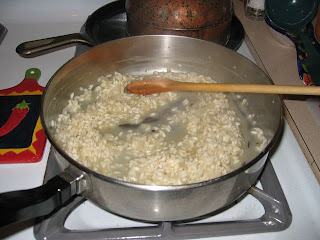 When risotto is getting close to the right consistency, add the broth in 1/2-ladle increments. 5. 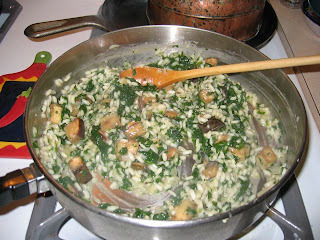 Add eggplant and spinach, stirring to combine thoroughly, along with another 1/2-ladle of broth. 6. If eating alone, remove all but one serving-worth (there are about three to four servings there) to a storage container. 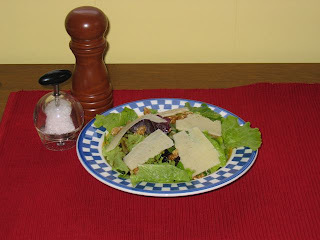 Then sprinkle walnuts over portion that remains in skillet, and grate in 2 Tbs pecorino cheese. Drizzle remaining broth (should be less than a ladle-worth) into skillet, then stir gently to combine. This is more a method than a recipe; a lot of things didn't go exactly as planned, and I had to do a lot of fiddling. But the outcome was YUMMY. Start with a package of Chebe focaccia mix. Preheat oven and mix as directed. Divide the dough into two parts. Add an additional 1 Tbs milk and about 2 Tbs grated pecorino toscano cheese (or other pecorino or parmesan) to one part, and set aside. Add about 1/4 cup steamed, chopped fresh spinach to the other part. Here's where it got dicey: the spinach wouldn't combine with the dough in my mixer, and when I went to knead it in by hand, I discovered that the dough was WAY too sticky. So, I pulled out my bag of tapioca flour and started adding, bit by bit. I added quite a few times, and quit while the dough was still pretty sticky, because I know Chebe isn't as good when it's too dry. 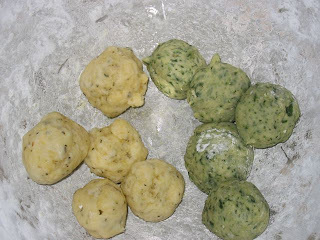 Next, I divided each dough ball into 12 smaller balls (see above). 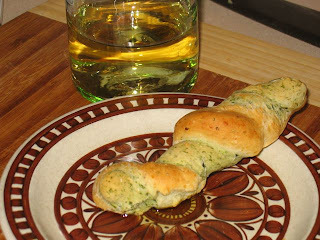 I then picked up a cheese-dough ball and rolled it into a thin 'worm' between my palms, then did the same with a spinach-dough ball and set it beside the first. 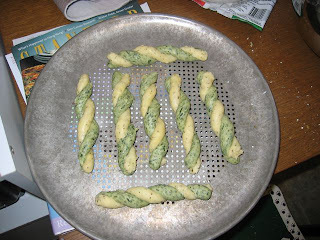 I twisted them together, gently; they stuck easily, and were pretty delicate. I repeated the process with six more pairs of balls, because that's as many as would fit on my pan. I froze the rest of the dough for later. As suggested on the package, I baked the twists at 375°F for 25 minutes. And, I ate the first one with a little olive oil and some wine. Yum! I haven't posted in a few days, as those of you who are following this will have noticed. The main reason is that I've been eating mostly the same thing: yogurt with (berries,) almonds and honey for breakfast, focaccia sandwich for lunch, stuffed tofu, roasted potatoes and a salad for supper. Last night, my parents took me out to dinner at one of Providence's top restaurants (which is seriously saying something - yes, we're the smallest state, but we've got some of the best chefs, thanks to Johnson and Wales), Al Forno. I was worried: could I find something to eat? Could I find something healthy to eat? Could I avoid over-eating? The answers: Yes, yes and mostly. I probably would have been fine with the spectacular local zucchini and corn salad for my entrée, but the plate of roasted and grilled vegetables on the side really didn't hurt. There were no appealing desserts that were completely gluten-free (the flourless chocolate cake has its pan dusted with flour, and I wasn't in the mood for granita), so I was going to settle for a capuccino, but then my mom's special dessert came with its dulce de leche gelato piled into two little demitasse cups. I snagged one. It was very yummy, and really a nice size. Tonight, I'm celebrating the spoils of my weekly farmers' market excursion, which was yesterday morning. I managed to spend a great deal less this week, probably due to my skipping the nime chow. I couldn't skip the strawberries, though; they were far too pretty! To make this salad, I sliced three strawberries into the bottom of a bowl and covered them with balsamic vinegar, about an hour before supper. 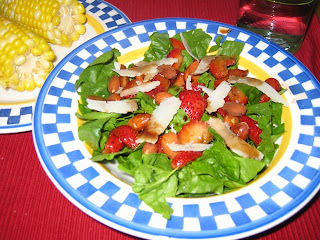 Later, once the corn was in its boiling water, I spun the spinach dry, lifted the strawberries out of the vinegar with a fork, sprinkled on some almonds and used a vegetable peeler to make little shavings of that pecorino toscano I still had in the fridge. I drizzled on a little of the balsamic, but didn't add salt because I remembered how strong the cheese is. I have always loved my corn on the cob bathed in butter. Tonight, I tried it unadorned, and it was delicious. Much less messy, too. I think I'll try the other cob-worth off the cob. I have a 2-kg bag of masa harina in my fridge (where I keep all my flours, to protect them from bugs), a bit of quesadilla melting cheese, and a green bell pepper from the farmers' market. I think quesadillas con elote y pimiento verde might be in order, some night this week. But first, I need to make a risotto to use up that third portion of eggplant, the one I sautéed in cubes. Wouldn't it be pretty to serve risotto in a steamed bell-pepper shell? I'll have to try that, in the future. Chebe (pronounced 'chee-bee,' according to the back of the package) is one of my favorite mixes for pizza dough, focaccia, and several other applications. It comes in various flavors, and has this great, chewy inside, in the way really good bread sometimes does, while being pleasantly crispy outside. 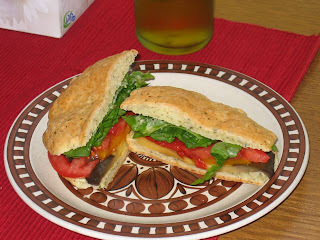 In this simple sandwich recipe, I bake the focaccia mix in four sandwich-size pieces, slice them open, and layer them with yummy summer vegetables and a pesto mayonnaise. Yum! 1. Slice half of a medium-large eggplant into thick slices the long way, salt generously and set aside in a colander to sweat and drain. After 30 minutes, pat or spin dry. 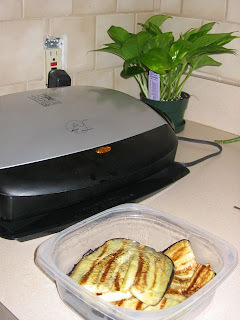 Grill on an electric grill (e.g. George Forman grill) about 7 minutes, until soft but still staying (at least mostly) in one piece. 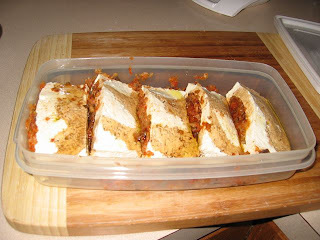 Brush lightly with olive oil and layer in a storage container; can be made a day or more ahead of sandwiches and kept in refrigerator until desired. 2. Prepare one package of Chebe focaccia mix as directed, with the following modifications: add 7 Tbs milk instead of 5; add about 1/4 cup grated pecorino romano (or similar) cheese after milk has been added, mixing well to incorporate; divide and form dough into four round, flat loaves instead of one large one. Bake as directed and cool completely. 3. Mix mayonnaise and fresh pesto sauce, two parts to one. (Adding minced fresh basil, garlic and a little olive oil to mayonnaise will also probably work.) I used Nasoya soy mayonnaise, because it's what I had on-hand. I recommend it: it tastes exactly like regular mayonnaise, but is cholesterol-free. 4. Slice cooled focaccia in half, like hamburger buns. Spread both cut faces thinly with pesto mayonnaise. Layer in one slice of grilled eggplant, two pieces of roasted bell pepper (I had a jar in my pantry, but they're easy to roast yourself), two thin slices of fresh tomato, and about 3-4 leaves of fresh spinach. Close sandwich and cut in half (if desired), for easier eating. Warning: This is one juicy sandwich! Have plenty of napkins ready! 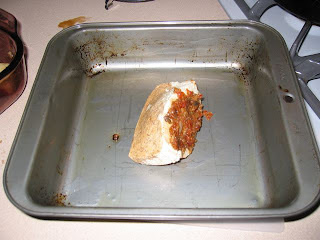 Or, pat eggplant, pepper pieces and tomato slices dry with a couple of paper towels before assembling sandwich. This makes it a lot neater. 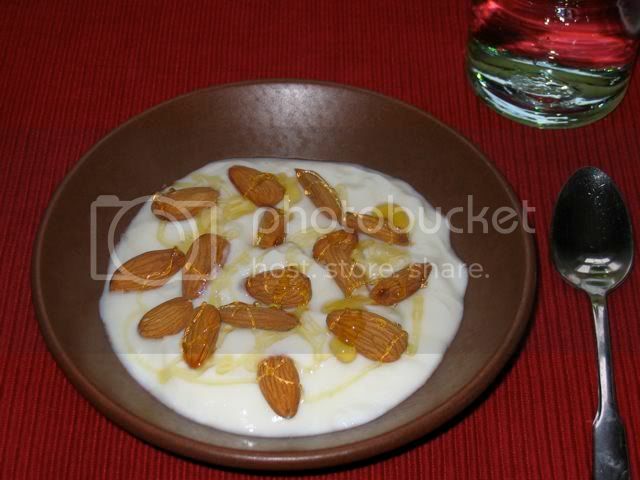 As I mentioned before, one of my favorite breakfast standbys is plain yogurt with almonds and honey. When berries are available, they're a must-add for this morning treat. One little muffin is a nice accompaniment, too. In my ongoing quest to get as many of my foods from local sources as possible, I've started having my dairy delivered. The yogurt, though delivered by my local dairy, is still Stonyfield, which is ... from Vermont, I think? Two states away, but as I like to say, they make states little around here. The milk, however, is from right here in RI. How cool is it that I can place my milk-delivery order online? 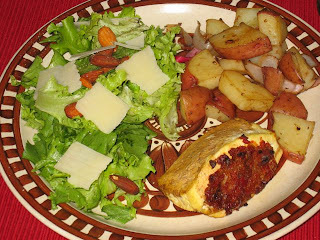 As promised, for dinner tonight I baked up one of the stuffed tofu "steaks" that I prepared last night, and I also roasted some farmers'-market red potatoes and red onion as a side-dish. The meal, in addition to being strictly gluten-free, would have been entirely vegan if I hadn't given in to the impulse to put a little reduced-fat cheddar on my salad. NOTES: Since tofu takes the flavor of anything it touches, it really is best to assemble this a day ahead of time. This recipe gave me my first opportunity to use my new food grinder attachment for my Kitchen Aid mixer. I think I'm in love! A food processor fitted with the sharp blade would probably also work, or if you're really determined, you can chop the filling by hand. 1. Drain a block of tofu (usually around 1 lb) and place it between two large, flat plates with something heavy on top such as a textbook. Leave for 30 minutes to press out excess water. 2. Meanwhile, cut two 1/2-inch-thick round slices from a medium-large-sized eggplant. Salt slices thoroughly on both sides, and leave in a colander 30 minutes, to sweat out excess moisture. 3. Place about six sundried tomatoes in the bottom of a small, non-reactive bowl, and cover with boiling water, then place a plate over the bowl to keep in heat and steam. Wait five minutes, then drain. 4. Feed sundried tomatoes, five peeled cloves of garlic, and 1/2 white onion (peeled and cut into small chunks) through food grinder. When eggplant has sweat sufficiently, pat it dry (or spin it in a salad spinner), cut it into chunks and feed it through grinder. 5. Heat about 1 Tbs olive oil in a sauté pan over medium heat. Add ground eggplant mixture and cook, stirring occasionally, until just starting to dry out and stick to pan. Deglaze pan with dry white wine (I used Pinot Grigio), about 1/4 cup, and continue to cook, stirring, until most of the liquid has cooked off. 6. Drain tofu and place on a cutting board. Slice into five thick slices, then cut a pocket into the long side of each one. Use a teaspoon to fill each tofu "steak," gently pushing as much filling into each as possible. I used about three spoonfuls per "steak," and had only a little filling left over. 7. Place "steaks" in a container with a tight-fitting cover and drizzle with olive oil and balsamic vinegar. Spoon any leftover filling into the container, as well. Close tightly and refrigerate overnight. 8. When ready to bake, preheat oven to 350°F, lightly coat a pan with olive oil, and place desired number of "steaks" on pan. Bake 45 min. Serving size: 1 "steak." NOTE: This dish has the same baking temperature and time as the tofu "steaks" above, and can be cooked simultaneously. All measurements are approximate, and estimated after the fact. 2. 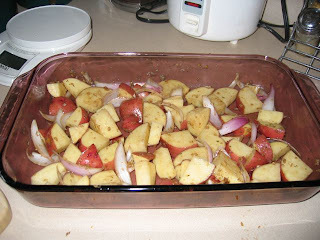 In a (preferably Pyrex) 9"x13" baking dish, combine 1-2 Tbs olive oil, 3 minced garlic cloves, 1/2 red onion (chopped into chunks and layers separated), 2-3 Tbs balsamic vinegar, 3 cubed red potatoes, and about 1/2 tsp each of oregano and salt (to taste). Stir gently with a wooden spoon to coat potato pieces thoroughly. 3. Bake 45 minutes, stirring every 15 minutes with a long-handled wooden spoon. As pictured above, I rounded out these two greenless dishes with a nice, fresh salad. Portions for the tofu and potatoes were decently small, and the salad made the plate look full without adding too much additional weight. In the future, I'll probably go easier on the serving size for the potatoes - I'm totally stuffed, even about 30 minutes after finishing my supper! One of my original goals, in starting this, was to get more of my food from local sources. The reasons for this are two-fold: first, I know I need to make vegetables and fruits a bigger part of my diet, and since locally-grown produce is usually fresher and riper, it is usually more tasty and therefore more appealing, to lure me away from my heavy-starches-and-fats habits. Second, small-scale farming is better for the environment, and local produce uses a lot less fuel in carting produce from farm to consumer. This is the reasoning behind my weekly farmers' market sprees. The next step, of course, is actually to eat the food before it spoils. This has often been a stumbling-block for me. Luckily, I'm a teacher, so my greatest free time coincides with the greatest availability of fresh, local produce. 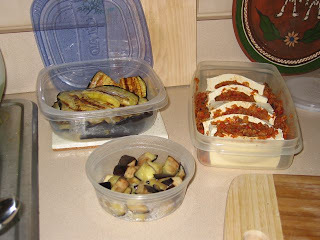 Two items in my refrigerator this week have been a block of tofu (grocery store, not farmers' market) and an eggplant. I'd been thinking about how I might like to prepare the tofu, and decided to try stuffing tofu "steaks," similar to the way Japanese chefs stuff tofu with spiced meat. Being a vegetarian, I tried to think of other things, and settled on eggplant, among others. I think the recipe for the "steaks" shown above, currently raw, will appear after I bake and eat one, probably tomorrow night. But can I just say? I love my Kitchen Aid mixer! The problem was, I knew I was only going to need a small amount of eggplant for this recipe, and that the eggplant would spoil more quickly once it was cut. What else could I do? I went ahead and cooked the rest, two ways: grilled slabs that I will make into sandwiches on Chebe foccaccia, with fresh tomato and basil, and small cubes that I sautéed in olive oil and garlic and will put into a risotto at some point. I used to hate eggplant, by the way. The turning point, for me, was when I learned to salt it and let it sweat before cooking it. Cuts the bitterness and brings out the sweetness beautifully. If you're worried about your salt intake, you can rinse it gently after it has finished sweating; otherwise, just pat or spin it dry. I used my salad spinner, which I also love. One of my very favorite foods is fusilli al pesto. 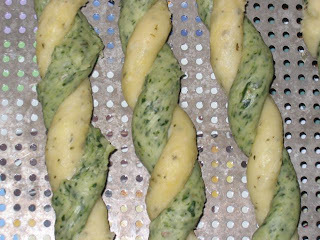 I just love the spring of the twisty noodles and the perfection of basil, garlic and olive oil. Having bought a new brand of rice pasta at Spezia the other day, I decided last night that it was time to try it. 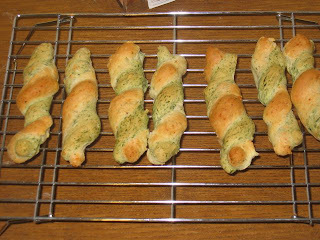 I also pulled out a couple of the "garlic knots" that I'd bought, frozen, at Risotteria last February. I was sadly disappointed by th garlic knots ... they were supposed to be baked for 10-15 minutes, but after 30 minutes were still unpleasantly doughy. This is one of the shortfalls of saving heavier foods for "treats." Sometimes they ... aren't. I feel an ode to my Kitchen Aid mixer forthcoming. I seriously love that thing. I'm kicking myself, right now, for not taking a photo of breakfast before we sat down to eat it. I had the table so nicely laid-out, with a pretty table cloth and everything. *sigh* C'est la vie, I suppose. My friends T. and R. were visiting (my first houseguests at my new house! ), and I made us all breakfast this morning. Really, I just rewarmed some of the zucchini muffins from the other day, rinsed and put out some blueberries I got at the farmers' market yesterday, and made cheese grits, because T. loves them. 1. Heat a very small pat of butter on medium low heat. Add 1 clove of garlic, pressed, and heat until fragrant. Add a dash of oregano. 2. Stir in 2 1/2 cups of water and bring to a boil. 3. Once the water is boiling, slowly stir in 1/2 cup Quaker Quick Grits (or similar), then reduce heat to medium-low and cover. Cook, stirring occasionally, about 12 minutes, until thick. 4. Add 4 oz. shredded cheese (I used Hunter's Seriously Sharp Cheddar from Cabot Creamery), and stir to blend. Stir in a dash of ground cayenne pepper. I probably should have added a pinch of salt, to bring out the other flavors. I was afraid the cheese would be too salty, but it really wasn't. The big breakfast happened for two main reasons: company, and my plan to give blood today. We had also made plans to meet up with our friends N. and K. for ice cream, which I usually consume in large quantities after giving blood. I need the calories and blood sugar, and it's a great opportunity for a much larger portion of treat than I would normally (these days) consume. I've only had ice cream one other time this week (gelato, actually), so I'm still making progress at eating more healthily overall. And darnit, this isn't about having to justify every bit of fat and sugar I eat (I tell myself ... but it's still hard to believe, sometimes). It was a really nice day for sitting in the gazebo in the park with our ice cream, I have to say. Tonight, for dinner, I had three large salads. That is, I had the same type of large salad three times. I just had too many greens to finish, and the farmers' market is tomorrow morning, again, already! I think it was still decently healthy because I used apple cider vinegar for "dressing" (which is what I usually use), and kept the scattering of almonds and shavings of reduced-fat cheddar to a minimum. I hope this isn't rationalization. I hope that eating three servings of mixed salad greens is actually a good thing. As expected, I haven't noticed any difference in my waistline. But, I remind myself, that wasn't supposed to be the point. My friend N. left me a bar-cookie or cake-like sweet thing she'd baked, when she left the GF beer bread. I think it will go nicely with a glass of milk, as a bedtime snack. I had a performance tonight, in a faculty recital for a summer camp where I'm teaching this week. It was the first time that I'd performed a solo (not as part of a chamber or larger ensemble) since ... maybe my master's recital in 2000? Wow. It went really well, fortunately, but I was very nervous all day and indeed all week. When I know I'm going to need my strength, I tend to turn to eggs. Tonight, I decided to give egg whites a chance. I haven't really liked them scrambled, only hard-boiled, but I hoped that adding enough mix-ins would improve the situation. I washed and chopped the last of my farmers' market basil and not-at-all-the-last of my farmers' market spinach, and also mixed in a little garlic, salt and pepper, and some grated pecorino toscano from my Federal Hill foray yesterday. Conclusion? I'll definitely try this dish again later in the summer, but if I use a similar cheese, I probably won't add any additional salt. And I'll do a better job of separating the eggs: a little yolk ended up in there, after all. I like to think there's a difference between obsessively thinking about food all the time, in a compulsive overeater sort of way, and thinking about food frequently because cooking creatively is a hobby and a joy. Sometimes, especially when I have perishable ingredients on hand, I like to daydream about how to use them best. As I've mentioned, I went a bit overboard at the farmers' market last weekend, so I am now frantically embroiled in what my friend L. calls "the race against the rot." I've been eating salad at such a frantic pace that my broccoli - my favorite vegetable, as long as I can remember - is lying neglected at the bottom of the crisper. Which means, of course, that the zucchini hardly stood a chance. Until I remembered about zucchini muffins. 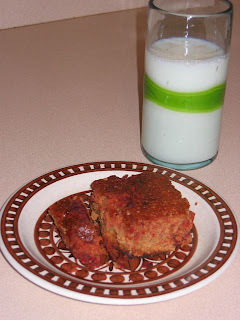 I've never made them before, but luckily I had all the ingredients on-hand for Bette Hagman's recipe (from The Gluten-Free Gourmet), except the raisins, which I don't really like in zucchini muffins, anyway. They came out very small, but toasty/crispy on the outside and moist/spongey on the inside. Absolutely lovely. 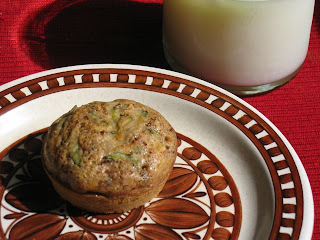 Despite having used organic white sugar, and the recipe calling for oil rather than butter, I decided these probably fall under the category of 'treat,' so I filled up most of the way with a bowl of brown rice, first, and then had my one muffin with a small glass of milk. 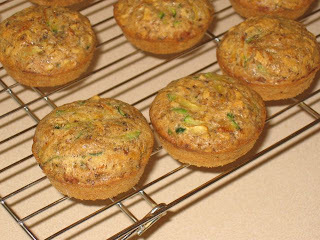 There's something really fantasic about fresh-from-the-oven muffins for breakfast. But, wow, is summer a rough time for having the oven turned on to 400°F (204°C)! Something to remember, as I plan other baking experiments for the rest of the summer. A few weeks ago, my parents and I drove from Massachusetts/Rhode Island to the Florida panhandle for our annual family reunion. For me, the trip means two main things: (1) a valuable opportunity to keep in touch with my cousins, most of whom live more than a thousand miles from me, and (2) very few good food options. It starts, of course, on the road, where lunch tended to consist of a Wendy's side salad and a plain baked potato. Don't get me wrong: Wendy's salads tend to be decently fresh and crisp, but they also tend to consist mostly of that tasteless, nutrient-lean, pale-green stuff known as iceberg lettuce. 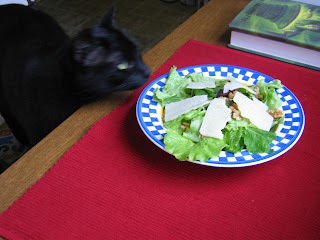 I like to buy a mix of different lettuces/greens, then adorn them simply, in this case with a few shaves of that 75%-reduced-fat cheddar I've been enjoying so much, a smattering of walnuts, a drizzle of balsamic vinegar, and a sprinkling of sea salt and freshly ground pepper. It looked so good, even my cat wanted to check it out! Hey, Charcoal: what do you think about becoming a vegetarian? ... yeah, that's what I thought you'd say. Well, to quote my dad, "More for me!" One of the keys to making this healthier-eating plan a possible one is that I never tell myself, "you can't eat that ever again." Unless it's, you know, meat or gluten. 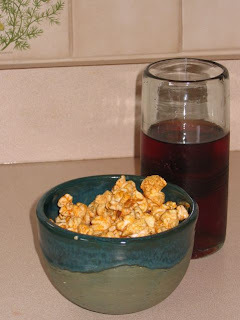 I can still enjoy barbeque-flavored kettle corn from Popcorn, Indiana, but now I'm trying to eat it kernel by kernel, not handful by handful. Luckily, I already prefer 100% juice blends (like Apple & Eve berry punch) to cokes. Actually, after all the water I've been drinking this week, I was afraid the punch would taste too sugary. It was mostly just nice, though. A little popcorn, a little juice, a little TiVo. A nice way to take a break from a hot, sticky afternoon. In Europe, or so I hear, it's common to follow meals with cheese instead of sweets. I was feeling a bit hungry after the brown rice/spinach/tomato extravaganza from earlier this evening, so I thought I'd finish up with a bite or two of the pecorino I bought this afternoon. This is, alas, not the cheese I hoped it would be. (Somehow, that sounds to me like the basis for a Saturday Night Live sketch. But I digress.) I was entranced with the soft, mild pecorino I had the fortune to eat in Tuscany a couple of summers ago, but this is a hard, crumbly, salty cheese. Nonetheless, it's very, very good. And its saltiness makes it lend itself well to very small portions. Something I learned in Tuscany was to eat pecorino with honey. I happen to have some "Lemon Crest" from Magnolia Honey Jelly, so I thought I'd try that. 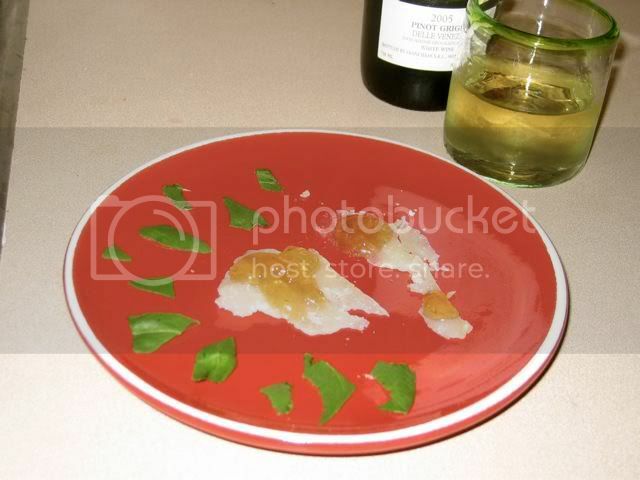 Then I decided the plate needed some green, so I tore up a basil leaf to arrange artfully around it. Finally, I poured myself a small measure of some pinot grigio that I was given as a thank-you gift for playing in a master's conducting recital, which was open in my fridge. Normally, I prefer red wine, but the sweetness, saltiness and crispness of the honey, cheese and basil seemed to want to be paired with white. Perfection! The jelly balanced the saltiness of the cheese, and the basil cleansed the palate between bites of richness. (And the wine, of course, didn't hurt one bit.) It only took a very small quantity to make a very satisfying end-of-day snack. How do you like your brown rice? When my friends J&J and I all lived in Chicago, they had me over for dinner one night and introduced me to the wonder that is brown rice. Before that evening, I'd never really liked it before. 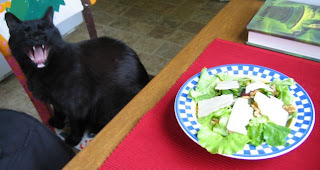 But at their house, it was served family-style, where we could each help ourselves to a scoopful or two, and surrounding the bowl were plates of cheese cubes, chopped tomatoes, probably some salad greens, herbs, and other summertime delicacies. Clearly, this was the way to enjoy brown rice. Not as an apologetic stand-in for white rice, under a stir-fry, but as a centerpiece all its own, paired with crisp, fresh flavors that complement it. 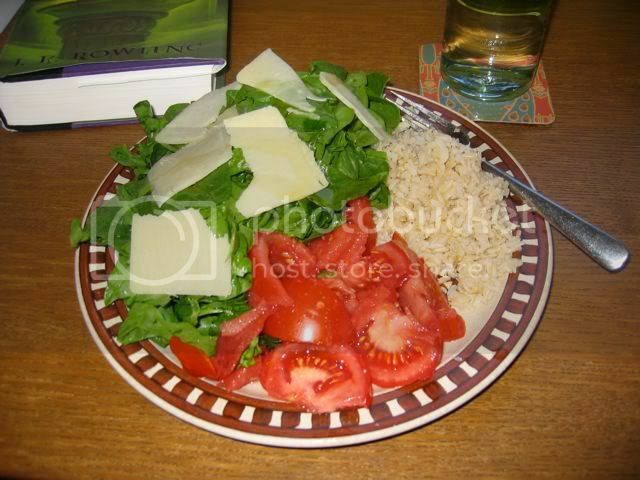 Dinner tonight is a plateful of color, with brown rice, fresh spinach topped with shaves of that 75%-reduced-fat cheddar I mentioned (Cabot), and a fresh farmstand tomato, all sprinkled with sea salt and drizzled with extra-virgin olive oil. So pretty! And so yummy. I'm lucky enough to live in a place where there are some WONDERFUL gluten-free treat options. One of my favorites is Ursula's European Pastries in Cranston, RI, for the cakes-and-pastries type of treat. Twist on Angell is excellent for the pizza-and-beer (or pasta) type of treat. I used to frequent both, well, frequently, partly because of the novelty of having such an abundance of options, and partly out of a desire to keep GF-friendly businesses doing GF-friendly business. Since moving into my new house, and since the summer started, I've been spending a lot less time at both. Partly, they're not cheap, and partly, those are some rich/caloric/high-fat treats. Staying on a gluten-free diet, it's very tempting to try every new product that comes along, to reconnect with old "friends" that have been lost to me because of the evil grains they contain (I say, tongue firmly in cheek). Until about a month ago, I was living on cheese and starch, eating ice cream and cookies and cakes at least daily, which I knew was not a pattern I should be preserving. As I develop my "possible eating" philosophy, my question for myself becomes this: how do I see the role of treats in my diet? As I try to get away from my emotional eating habits, I want to stop thinking about treats as something I "earn," but I still want to enjoy them on special occasions. I am serious about not wanting to deny myself these treats entirely; the solution seems to be, in fact, the word "treat." I want to divorce cakes and cookies and pizzas from the value judgements of "bad" or "good" and from loaded words like "indulgence," that make them sound like a surrender. I can eat rich, sugar-and-butter-laden baked goods, and still be eating, overall, in a healthy manner. The key, I think, will be frequency and quantity. I am ready to pass by gluten-free goodies in the market, knowing I can try some later. "Moderation in all things," as a friend of mine from the Catholic choir at my university said, "including abstinence." So, how do I feel about my plan to stop at Ursula's this afternoon being thwarted by their two-week summer vacation? Was I saved from my temptation to 'cheat'? I don't think so. I haven't been there in over a month. Plus, by getting off the bus at that point, I ended up having to walk the mile-plus home from there. I had stopped earlier at Spezia market on Federal Hill, which has a decent selection of gluten-free products, some of which I hadn't seen before. I bought three items I haven't found elsewhere: Orgran amaretti-style cookies (very low percent of calories from fat, I discovered to my delight, and the sugars are unrefined), Scotti Pasta Riso fusilli (a brand I've been curious to try), and a sliver of Pecorino Toscano (D.O.P.) cheese. Once I discovered Ursula's to be closed, I decided to enjoy a couple of the amaretti on the walk home. A good compromise, I think. And quite a tasty treat. Last Saturday, I went to a farmers' market for one of the first times ... definitely the first time I've gone alone. Predictably, I went a little overboard, got a little overwhelmed and carried away. Among other things, I came home with a pound of fresh spinach AND a ginormous bag of salad greens. Add to that the fact that I'm teaching this week at a program that provides lunch, and I'm eating salad three meals a day just to keep ahead of the wilting. Yesterday, I had a spinach salad, consisting just of a huge pile of rinsed, torn up, fresh spinach, a drizzle of apple cider vinegar, and a few thin shaves of 75%-reduced-fat cheddar cheese. Also a glass of water and, when it was ready, a small bowl of brown rice. Today, I'm a bit sick of salad. 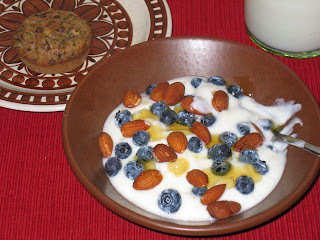 So I've gone back to an old favorite: plain yogurt (about 8 oz), topped with a small handful of raw almonds and a drizzle of local honey (bought in my hometown, which I suppose makes it my hometown honey!). YUM. I'll probably end up having some salad before I head over to work, just out of obligation. Whew! That introductory post was a bit tl;dr, wasn't it? Sorry. Now that that's out of the way, here's a recipe I made this evening. It's wonderful in hot weather, because it requires no cooking and is cooling to eat. This is a Bulgarian dish called Tarator. 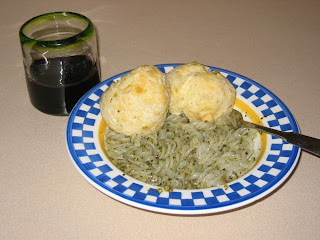 A couple of Bulgarian colleagues taught me how to make it, when I lived in Monterrey, Mexico, in 2000-2002. The garlic is apparently a variation that is preferred in the eastern city of Burgas, where one of my friends originated. I like it, so I use it. The walnuts were pecans when they taught me, but walnuts were not common in Mexico, so it's possible that they were the intended nut all along. Also, they're much cheaper, and have lots of Omega-6's in them. Proportions are approximate. Feel free to eyeball it. Sorry that they're all in English units. I usually just mix this in a 1-qt plastic container. 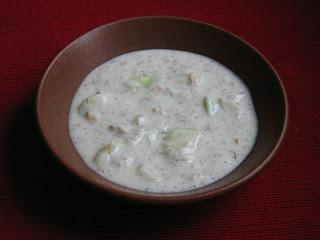 Fill it up about halfway with yogurt, then add koper or dill, minced garlic, and 1 tsp salt. Stir. Cut the cucumber into small pieces (I use a paring knife, cutting right above the container so the pieces fall in). Stir, making sure to distribute the cucumber as evenly as possible. Add walnuts and stir again. Add a little bit of water, maybe 1/4 cup, and stir, then check consistency. Add more water and salt as desired. I usually end up adding enough water to fill to near the top of the container. Flavors meld with time, so I recommend letting your "soup" stand for about 1 hr before serving. Depending on freshness of cucumber and yogurt, this should keep at least a few days in the fridge, tightly covered. When I was 25, I was diagnosed with a mild resistance to wheat; I changed my diet somewhat, but really kept 'cheating' by eating cookies, cake, fresh-baked bread, Krispy Kremes … Within the past few years, I've reduced my gluten (wheat, rye, barley, oats) intake dramatically, and finally entirely, as my sensitivity has increased. I enjoy walking, swimming, and riding my bike; all three of these tend to take back-seat to my other favorite activities of reading, watching my TiVo/Netflix entertainment, and LiveJournaling. And have I mentioned cooking? First, a little (more) about me: I'm 32, as of this writing, and I recently bought a house in Rhode Island. I'm single and live alone, and carry the mortgage alone. I've been playing the oboe for nearly 25 years, and currently freelance professionally and give private lessons, in addition to teaching at a girls' independent school, mostly in the high-school division. To me, this is beside the point. I'm trying to love the way I look, because I'm pretty much stuck with it. Despite what popular culture would have us believe, I might start exercising 30-60 minutes every day, eat perfectly balanced and portioned meals with only small, healthy snacks between, and never lose a pound. The point is, I know I've been eating unhealthy foods in unhealthy quantities, and spending too much time on the couch. There is nothing dramatic or angst-ridden here. I refuse to flagellate myself over a slice of cake, or to deny myself all the foods I find yummiest. I'm simply a (relatively) normal person, with the (relatively) normal food issues that one tends to have, having grown up in the Western world. And I've got a few habits I'd like to change. Let's review: I'm a new, single homeowner, living on the schedule and salary of an almost-but-not-quite-full-time private school teacher plus freelance oboist/teacher, so budget and time are huge issues. I have a diet restricted by choice (vegetarian, ovo-lacto) and by health (gluten intolerance). Time is much less of an issue during summer, and it is no accident that I'm starting this now. I also find a new home to be a good opportunity for new habits. What will be here? Mostly recipes/accounts of foods I have eaten and enjoyed. Other food-related topics will also probably appear, and hopefully exercise as I get into it. My approach is to understand that I need to change gradually if I'm going to stick with it, which may mean attacking only one or two goals at a time.